The recent attacks on Uri by Pakistani trained terrorists is part of a strategic chess game that has been slowly playing out over the last decade, but one that has been ramped up recently in moves made by the Modi government. A little history first on how we got here. There are 2 ports at the intersection of the Arabian Sea and the Gulf of Oman. This is a very strategic area because most of the oil that comes to India and China goes through this area and protection of the major sea lines of communication is therefore recognized as an economic imperative by both countries. The two ports are shown on the map below. 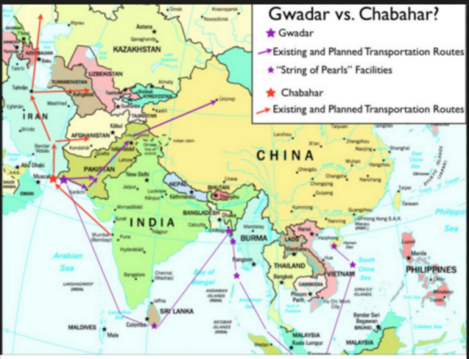 Chabahar (red star on the map) is in Iran and Gwadar ( purple star on the map) is in Pakistan -controlled Balochistan. These ports, 72 nautical miles apart, are very strategic for the two major powers in Asia: India and China. China has enunciated a policy called “ String of Pearls” regarding its potential interests in the Indian Ocean region. This is shown by the purple lines on the map. China has recently been trying to expand its naval presence in the Indian Ocean by building its civilian maritime infrastructure along the Indian Ocean periphery. They have attempted to make deals in Sri Lanka and recently in Myanmar by promising huge investments in port infrastructures to these countries. There are two critical components to the “ String of Pearls” policy: the port of Gwadar in Balochistan and the China-Pakistan Economic Corridor (CPEC) which runs through Pakistan Occupied Kashmir (POK). The CPEC consists of a 1300 Km road, known as the Karakoram Highway, which China built to connect its Xinjiang region to the port of Gwadar. This highway ( shown by the two purple lines) runs through the northern part of China, then through Pakistan, and eventually connects to the Arabian sea at the Gwadar Port. With the CPEC, and a commitment to invest $ 46 billion, China aims to expand its influence in Pakistan and across Central and South Asia in order to counter US and Indian influence. The CPEC also includes plans to create road, rail and oil pipeline links to improve connectivity between China and the Middle East. But the CPEC project has been strongly opposed by ethnic groups in the northern Gilgit-Baltistan region in POK, and the people of the Western Balochistan area which houses the port of Gwadar. They are very mindful of the fact that almost all the benefits of the CPEC will go to the Chinese and to the Punjab region in Pakistan which is home to most of the Military and Civilian leaders of Pakistan. To ensure the success of the CPEC, the Chinese have paid billions of dollars to the Military and Civilian leaders of Pakistan. India is greatly affected by The “ String of Pearls” policy. As the purple lines in the map show, it gives China a huge naval advantage by strategically engulfing India. India countered by this policy by negotiating a deal with Iran to develop and share the port of Chabahar. This port is only about 550 nautical miles from the port of Kandla in Gujarat and 770 nautical miles from Mumbai. As the red line in the map shows the Chabahar port provides India access to the markets in Central Asia but more importantly provides a way for India to trade directly with landlocked Afghanistan without having to go through Pakistan. Afghanistan is an important strategic ally for India and the two countries have had close ties for centuries. Afghanistan also has a region called Hajigak which is rich in iron ore. Estimates show that it has over $ 1 trillion worth of iron ore available to be mined and India has its eyes on this treasure. So India spent over Rs. 600 crores to build a highway to connect Delaram in Afghanistan with Zaranj on the northern Iranian Border. Iran on its part built the road from Zaranj down to the Chabahar port. India is also providing a $550 million in a line of credit facilities and steel to build jetties and berths at Chabahar. Let’s move this strategic chess game between the India-Afghanistan-Iran troika and the Pakistan-China combination to the present. Since coming to power PM Modi has made some very smart strategic moves. In a stroke of genius, he recognized that the key elements to the success of the “ String of Pearls” policy and the CPEC were the port of Gwadar, which is located in Balochistan, and the Karakoram Highway that goes through POK, an area over which India still claims rights. So in carefully calibrated moves he recently upped the ante on both POK and Balochistan. He made very clear statements to indicate India’s territorial interest in POK, and in his Independence Day address explicitly offered support for the plight of the Baloch people. And yesterday, Sept. 19th, India offered asylum and citizenship to Brahamdagh Bugti, leader of the Baloch Republican Party living in exile in Switzerland, and grandson of the very popular slain Balochi leader Nawab Akbar Bugti. Both these activities by Modi are a direct threat to the CPEC and the “String of Pearls” policy of China. The Chinese can see things slipping out of hand, and have started to push hard on their surrogates in the Pakistan military over which they have significant control having generously endowed their leaders with billions of dollars. The Pakistan military responds in the only way it possibly can..by letting loose its trained army of terrorists to go create some havoc in India in the hope of getting a reaction. The activities in Srinagar and the attack in Uri are both parts of this attempt by the Pakistan military to appease their masters, the Chinese. Unfortunately, such attacks are to be expected every time Mr. Modi ratchets up the game and mentions Balochistan and POK. India, however, is clearly ahead in this chess game. It has several strategic advantages. Firstly, China imports large amounts of foreign oil, and two-thirds of that oil must pass through the Indian Ocean. India sits astride the sea lanes providing China with energy. In the event of increased tensions, the Indian Navy could impose a blockade on China of vital shipping from the Persian Gulf and Africa. And, recognizing that the Chinese navy is superior and would not permit such a blockade, PM Modi recently signed a strategic defense alliance with the USA to bolster India’s naval capabilities in the Indian Ocean and the Persian Gulf. Secondly, the common terrain between India and China is extremely hostile and makes a land war between the two countries extremely unlikely. The 1962 war was a short war and India was caught unprepared. Most defense analysts agree that had the war lasted another 15 days the outcome could have been different, and the reason is the distance China has to move men and supplies to get to the border with India. The map of China below shows the geographic distribution of China’s population. The vast majority of China ( dark brown areas) lives along the coastline, and the hub of Chinese economic activity is its North East Coast. This is over 2500 Km from the closest border with India. The area bordering India is uninhabited and consists of arid desert and mountains. For China to fight a land war with India it would have to move men and materials unnoticed over long distances and very difficult terrain. In this day and age with modern satellite surveillance techniques, it is impossible to move an army and supplies without being noticed. A full drawn out land war between China and India can thus be virtually ruled out. And as far as a naval war is concerned the Chinese navy would have to cover thousands of mile along the southern end of Asia into the Indian Ocean. India has recently vastly upgraded its naval capabilities and credit for that must go to Indian defense analysts and governments over the last two decades who realized the importance of controlling the sea lanes in the Indian Ocean and the Arabian Sea. The Indian navy now has tremendous muscle, plus home field advantage, and the Chinese know that. The final nail in the Chinese coffin was the Modi government signing defense agreements with the USA and Japan to bolster its naval capabilities. Bottom line, it is virtually impossible for China to engage India in a long war. It will do so at huge peril to its economy and it knows that. Strategically then, India holds all the cards. The only move China can make, at this point, to protect its “ String of Pearls” policy, and its interest in the CPEC and the Gwadar port, is to use its proxy dummies ( the pun is intended), i.e., the Pakistan military, to provoke India into a traditional war in the hope of occupying the Indian army on its western front and in limited engagements with the PRC army in Arunachal Pradesh. Their hope is that India would see the futility of this, and perhaps the greater danger of a nuclear war with an unstable Pakistan, and engage in peace talks in which the Chinese would hope to negotiate unfettered access through POK and to Gwadar. But it’s looking like checkmate for the Pakistan-China duo, and Uri is a desperate attempt to force India into an end game. India should resist the temptation of engaging Pakistan in a land war in the J&K sector and instead focus on strategic territorial advances into POK. We could do this under the garb of destroying terrorist camps, but the objective should be clear: to capture territory in POK. Land captured should not be returned or negotiated away. In addition, Balochistan should be made an active front to keep the Pakistan Army occupied. The Balochis hate the Pakistanis especially after Musharraf assassinated their hero Nawab Akbar Bugti in 2006. The Pakistan Army currently has around 200,000 troops to control that area, and a strong and persistent Baloch rebellion could force them to double that number, drawing strength away from J&K and POK and making it easier for India to achieve its strategic goals in POK. Giving citizenship to Akbar Bugti’s grandson is another smart strategic move by the Modi government to hasten this activity. India has sadly lost 18 of its soldiers in Uri and the calls for retaliation are getting shrill. 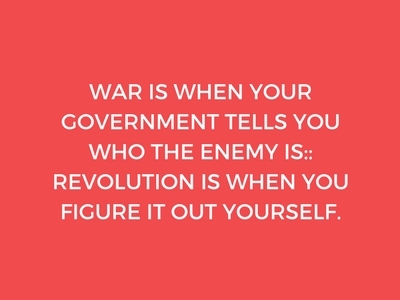 But it appears that Modi knows what he is doing. He has played an excellent game of chess so far. It is unlikely that he will get caught up in the emotion of the moment and lose focus of the big picture, which is destroying the String of Pearls policy and recapturing POK. And, with the help of friendly Balochistan and Afghanistan India can then engulf Pakistan with its own ‘Hanuman kundal’.